Guilherme Finkler scored right at the last to send Melbourne Victory through to the penultimate round of finals football. Both sides were as expected in the preview – Kevin Muscat opted for Jason Geria ahead of Scott Galloway at right-back, while Archie Thompson returned on the left of the attack. Frank Farina kept with the same side from the two consecutive wins over Perth and Wellington, with Alessandro Del Piero upfront. Ranko Despotovic was fit to return to the bench. The first half was action-packed with a spell of dominance for either side, before the tempo dropped dramatically in the second period. The opening five minutes immediately saw the establishment of the expected pattern – Victory dominating possession, Sydney defending deep – with theVictory passing neatly through the centre of midfield and putting Sydney’s defence under real pressure. 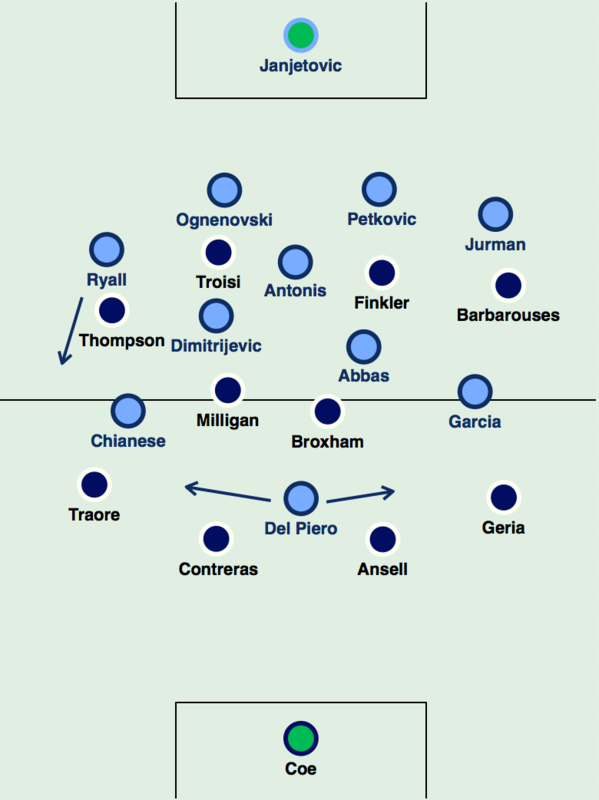 It initially seemed like the right-of-centre to Antonis would be the key zone, as it was in the 1-1, with Finkler finding a little pocket of space in behind Ali Abbas, and Archie Thompson moving over from the left to overload Sydney down that side – Kosta Barbarouses was flagged offside from a pass in this position. Sydney didn’t want a high tempo, because even though the Victory generally control possession in deep areas and work the ball forward from the back, they always retain a counter-attacking threat because of the pace of their wide players – that proved to be the crucial factor for the opening goal, with Thompson leading a quick transition and finishing the move with a fine curled finish. It was significant the goal originated from the Victory’s left – Sydney’s right – because that became the game’s key flank. Sebastian Ryall, a centre-back shoved out wide, was bold with his positioning, pushing high up the pitch when Sydney had the ball. Ryall’s played right-back for several weeks now, but this attacking edge has only developed gradually, and it was fascinating to see how determined he was to get forward in support of the right attacker. That, unfortunately, lead to the goal – Del Piero drifts right to collect a pass, Ryall overlaps energetically, and Pablo Contreras tackles the Italian, with acres of space now down that right-hand side from where Thompson scored. Even after the goal, though, Ryall continued to push forward, helped by the fact Joel Chianese played very narrow, always inside into goalscoring positions, and so opened up space down the outside. He, of course, scored the equaliser – an exaggerated example of his positioning, but illustrative of his attacking role. Chianese’s narrowness was exaggerated by his instructions to pick up Milligan when Sydney were defending, so that Abbas and Dimitrijevic could sit deeper and help Antonis defend against Finkler and Troisi, rather than having to come forward and press the two deep-lying midfielders. The major effect of this was to allow Adama Traore to advance forward, but that was a ‘sacrifice’ worth making to close down Milligan, whose forward distribution was stemmed by Chianese’s pressure. Sydney’s equaliser came in their period of pressure, which started around the twenty-five minute mark, having had to withstand waves of Victory attacks in the preceding period. Interestingly, this was more about territory than tactics – the ‘dominance’ started from a free-kick close to halfway, which was lofted into the area and fell behind for a corner, from which Sydney managed to ‘keep’ the ball in the Victory half. It sounds simplistic, but it was significant that they managed to get the ball into that area – it pushed the Victory back, broke up their momentum and finally allowed Sydney to start creating attacks. There were two other tactical features. First was the fact that the Victory dropped slightly deeper around the same time, with the front four becoming stretched from the ‘back six’. The lack of compactness meant Sydney players were getting time on the ball, with Terry Antonis coming into the game – in his deep-lying holding midfield role, he was sometimes free to hit probing balls forward, and more generally, covered a lot of ground defensively, breaking up play through the centre with strong tackling. Furthermore, Sydney also found an outlet through Del Piero, who started upfront but drifted to the sides to find space – especially when the Victory full-backs moved forward, so that when the ball was turned over, he was free on the counter-attack. The Victory centre-backs took a positive approach to him, challenging him from behind when passes were played into him at transitions. This had mixed results – it, of course, lead to Contreras dispossessing Del Piero in the build-up for the opening goal, but both him and Nicholas Ansell were booked for challenges on the Italian, with the former lucky not to receive a second for a silly kick in the second half. Del Piero also caused problems moving into wider positions when Sydney worked the ball into the attacking third – especially because the wide players are always a little higher up than the midfield two, Milligan and Broxham seemed uncertain of who should pick him up when he drifted towards the corners of the box. Del Piero’s familiar combination with Abbas was pivotal to the goal, with the Iraqi driving around his outside to find space to cross into the middle. After the break, there was an early period of renewed Sydney pressure, but the general theme was how drastically the tempo dropped – the game stopped being end to end, and increasingly became played at a pedestrian pace. It was as if both coaches had used the half-time break to encourage their sides to calm things down, which probably made sense: Muscat would have wanted to stop Sydney’s momentum, while Farina would have been concerned about Victory’s threat on the break. Tellingly, Ryall played a more reserved role as the game progressed, as if told to curb his forward forays and instead focus on narrowing the space for the Victory to counter into. The biggest spark, in terms of creativity, was coming from Antonis – he hit a clever ball in behind for Chianese whose chip went just over the top, and later, he set up Despotovic for a chance at the near post. Of the game’s three substitutions, Farina’s lone change was the only one of real interest. He brought on Despotovic to replace Chianese, which saw Del Piero go permanently left. That immediately increased the influence of Abbas, who, as we’ve come to expect, darted in and around the Italian to complement him off the ball, crossing dangerously for a Despotovic shot that flashed just wide of the near post, as well as drawing a few fouls when bursting forward. The counter-effect of the Despotovic change, however, was that the Victory could now pass freely down their right, with Galloway (on for Geria) often free to carry the ball forward down the flank. By this point, however, both sides seemed to have settled for extra time, and this was a fairly innocuous feature of the match. The thinking behind both coaches’ conservatism in the final stages of the game, with the expectation of extra time, is about minimising the risk of conceding and holding out for the extra half an hour – but the paradox of that, of course, is that it leaves you to vulnerable to a last minute goal in regular time if you drop too deep. It’s hard to criticise Farina for this here – Muscat had taken an identical approach, and it’s simply unfortunate for Sydney that the ball fell to Finkler in that position at such a late stage. A strange game. The first half was exciting but there was no overall tactical pattern, with only a few areas of strength for either side. They each had alternating periods of evenness, and that cumulated in a fairly even second half which was dictated by the overall dropping of the tempo. Sydney’s right hand side was a key feature: Ryall’s eagerness to get forward lead directly to the opening goal, but he effectively made up for it by scoring the equaliser – a good example of how an attacking full-back is effectively about risk management: does their attacking output account for the weakness created by their advanced positioning? 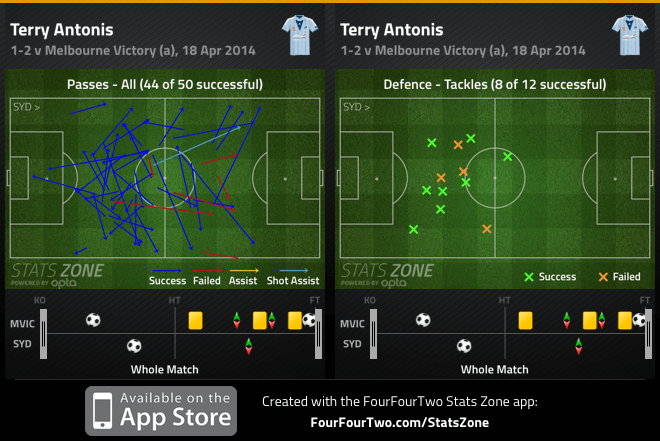 In this case, it was literally 50/50 – as was the general pattern of the game. Sometimes matches can be settled by small, non-tactical features, and that was the case here.